Nothing screams Valentine’s Day like red velvet, so I couldn’t have a week of Valentine’s fun without at least one red velvet recipe! Last year I had visions of sugar plum fairies and all sorts of red velvet goodness slathered with tangy cream cheese madness. I thought red velvet was the perfect food mascot for Valentine’s Day and had dreamt of doing a theme week of all red velvet recipes to celebrate Valentine’s Day. But Deborah beat me to it and I decided that despite my obsession with red velvet if I did a whole week of red velvet recipes I might actually turn a slight shade of red! 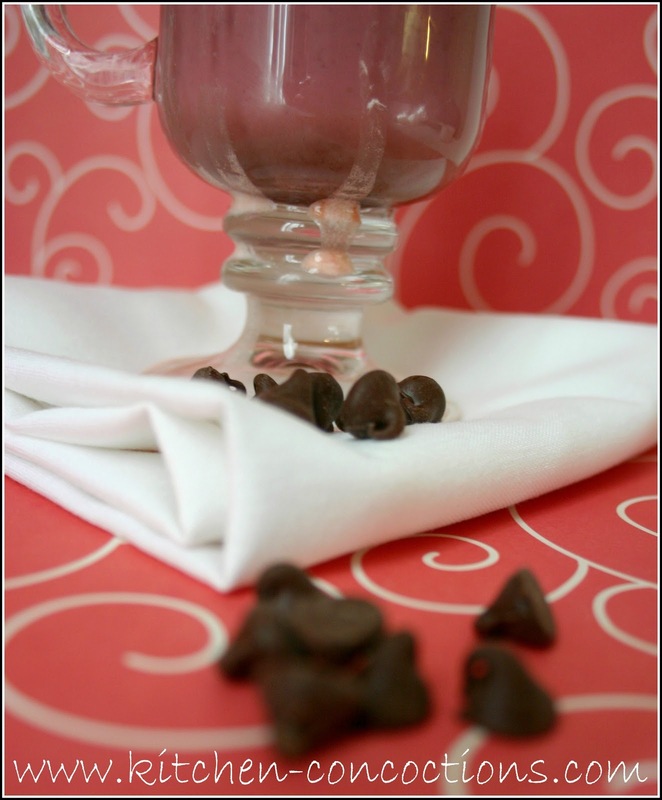 But of all the red velvet treats I have bookmarked, pinned, and hastily written down on a scrap piece of paper, I decided on this hot chocolate recipe to share this week. 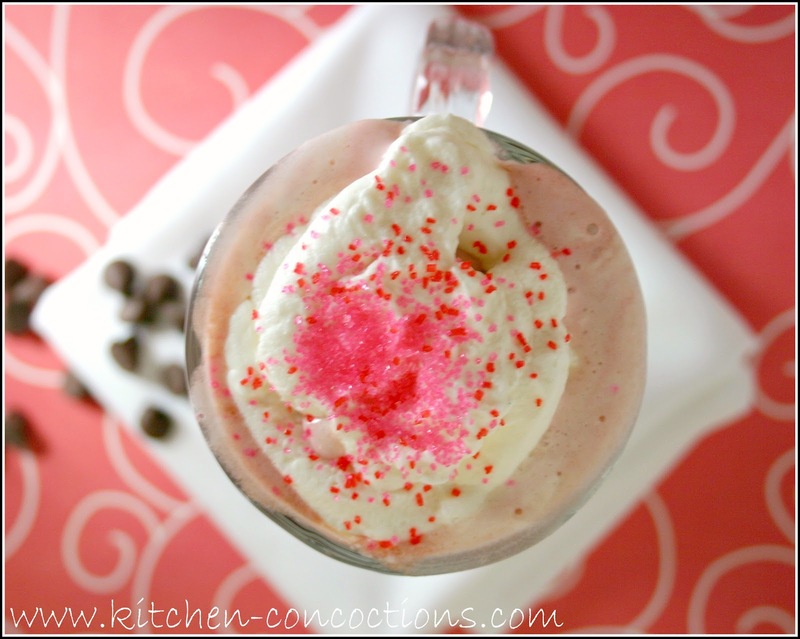 One, because of all the red velvet recipes I have seen around the web the past few weeks I have yet to see a hot chocolate recipe and B, after making a White Hot Chocolate in December, I wanted to try another fun spin of this cozy winter treat! 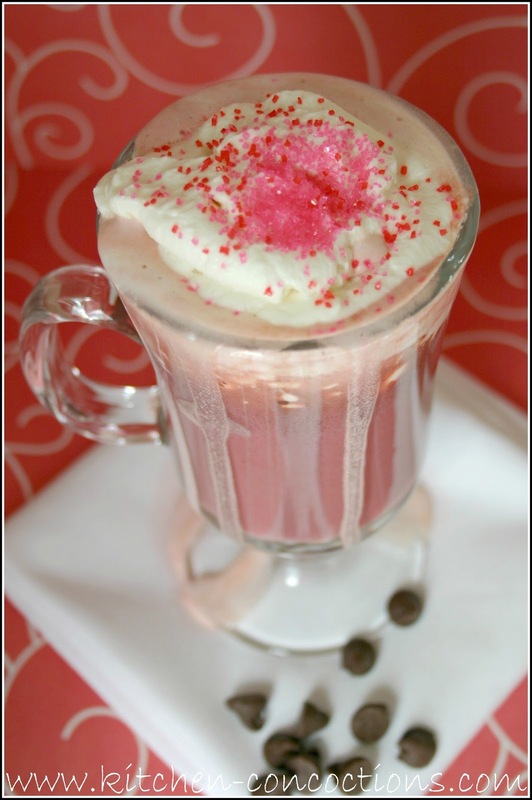 And boy this red velvet hot chocolate is rich and comforting, just like red velvet should be! Making it perfect for a cold romantic day! In a medium mixing bowl or a stand-up mixer, pour in heavy whipping cream, sugar, and ½ teaspoon vanilla. Whip on medium with the whisk attachment for 2-3 minutes. Just before it peaks, add the cream cheese and whisk for another 2 minutes being careful not to over-whip. Taste the whipped cream and add more cream cheese to taste. In a medium saucepan, heat the milk over medium heat. Add the chocolate chips, constantly stirring gently. When almost melted, add the red food coloring to desired deep red color and stir some more. When the chocolate chips are all melted, pour the hot chocolate in two mugs and top with the whipped cream. I think that I have red food coloring coming out of my pores right now, but it's so worth it!! I've had this recipe bookmarked forever – now I really need to make it!